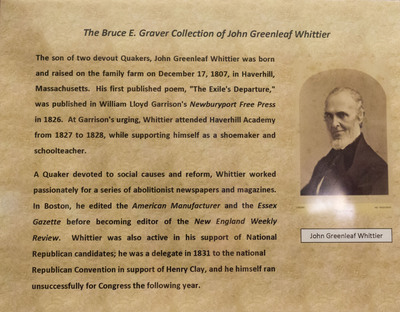 The son of two devout Quakers, John Greenleaf Whittier was born and raised on the family farm on December 17, 1807, in Haverhill, Massachusetts. His first published poem, "The Exile's Departure," was published in William Lloyd Garrison's Newburyport Free Press in 1826. At Garrison's urging, Whittier attended Haverhill Academy from 1827 to 1828, while supporting himself as a shoemaker and schoolteacher.